Festival de Ménigoute – 29th October to 3rd November 2013, this French fesitval aims to enlighten and promote initiatives for a better knowledge of nature and of its best management. Wild Tiger Productions – A production company based in New Delhi that offers Stock, Production Services, Location management, and Equipment Rentals from Sabyasachi Patra. Richard Hughes – An experienced shooting AP with broadcast credits: directing, camerawork and editing. Patrick Wermelinger – A cameraman, camera assistant or a 'making-of' cameraman in the wildlife fields, natural history, environment, conservation. Thomas Aveling – A cameraman with a Masters in Conservation Sciences. Gavin Shand – Passionate about conservation and dedicated to a career in wildlife filmmaking, Gavin is looking to gain experience as a Runner or Camera Assistant. Also with experience in Still photography, DSLR filmmaking and Time-lapse photography. Adam Spencer – Returning as a full member, Adam is a filmmaker and journalist specializing in wildlife and conservation. He is available to participate in your project as a cameraman, researcher, and editor. He is also the newest member of the Filmmakers for Conservation board and runs their social media. Will Nicholls – A natural history presenter and cameraman with a keen eye for a great shot. Will is also a multi award-winning wildlife photographer, being "Young British Wildlife Photographer of the Year" in 2009. FREE Hostile environment course, 4-5th June! HASP Training are running a Hostile environment course from the 4-5th June on their training site near Bournemouth and they've generously offered a couple of free places to our members!! 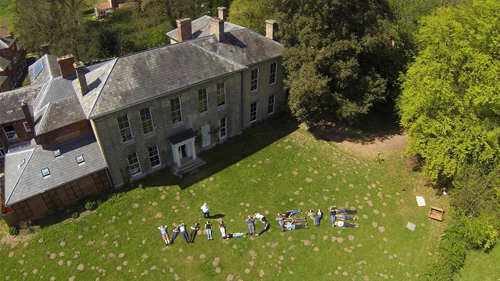 Available Wildeye Courses coming up this year! The last Introduction to Wildlife Film-making course of the year takes place at the end of this month :: 28-30 June 2013 – There's a few places left, so please do come and join us in Norfolk for a fun and informative weekend... It's the perfect way to start your wildlife film journey! Just £295 for the weekend with food and accommodation included!! The 36th Annual International Wildlife Film Festival is thrilled to announce this year’s award winners. The IWFF is the first festival of its kind and the longest running wildlife film festival and conservation conference in the world. Awards were presented at a First Friday ceremony on May 3rd at the Roxy Theater in Missoula, MT. Filmmakers Tom Veltre and Chris Palmer have recently been debating the controversial issues stemming from the Spiegel revelations about the film Chimpanzee - Rainforest Fiction: Disney 'Chimpanzee' Film a Splice of Life By Jörg Blech. After a hiatus of seven years from the sunny city, the Wildlife Photographer of the Year Exhibition is finally set to land back on the shores of Durban this July. The internationally renowned exhibition will take place at Durban’s uShaka Marine World from the 25 July to the 25 September this year. The exhibition launch forms part of the Wild Talk Africa Film Festival and Conference, South Africa’s premier natural history film event, which will be running from the 23-26 July. Alongside with Ecotraining, Beyond Borders Film School now offers two packages situated in two Big 5 game reserves in South Africa. Minimum 4 students, Maximum 6 students A 30 days course about wildlife filmmaking in the wild with extra lectures about African animals behavior, guiding ethics and ecology! A unique opportunity to make your own short documentary about any of the African wild animals! Plus an August Special on the Garden Route - R17,250 per person - Save 50% off our luxury package - a last minute special about our course in August!! Operation Jukani is Beyond Borders current production about the translocation of more than 120 big cats on the Garden Route of South Africa. Jukani Wildlife Sanctuary, which is a sanctuary that homes large wild cats (lions, leopards, cheetahs, black panther, tigers, mountain lions...), African Wild Dogs, Hyena's, snakes and Zebras, is currently situated outside Mossel Bay, approximately 150km from Plettenberg Bay. The animals at the sanctuary have been confiscated from hunting operations, circus's, and also over populations from zoos. Without organizations like Jukani these animals would have most probably been put down. Jukani has created a retirement village for their wildlife and they are in the process of moving their operation to a better location very close to where Beyond Borders Productions is based. Steven Ballantyne on his life and work in Asia. Steven Ballantyne, Asia based fixer, researcher, line producer, location scout /manager and founder of Expedition & Production Management (EPM) Asia Ltd talks to Wildlife-film.com about his life in Asia, his passion for logistics and why he is happy to help production companies for FREE with content development. Steven, you are originally from the UK, when did you move to Asia and what prompted the move? I moved to Hong Kong 5 years ago, there were a number of factors that lead to this decision but primarily it came down to life style. I love Asia and have spent over ten years exploring, working and experiencing as much as Asia as possible – from the Jungles of Papua New Guinea to the Deserts of China and Mongolia to the foot hills of Tibet and India – My personal adventures and remote location production logistics work have and continue to take me across this amazing continent, so moving to Asia was always on the cards. Get a Free Fact sheet from EPM Asia - Protecting camera kit from humidity. Ménigoute Festival - last call for entries! You may have already sent us one or several entries for this years' Festival de Ménigoute but maybe you will be pleased if we remind you that the 29th Festival of Ménigoute will take place from 29 October to 3 November 2013. Should you require a few weeks more to finish your film, please contact us and let us know how much time you need. We will welcome all your propositions of documentaries where are starring wild animals (birds, mammals, fish, insects…) providing they won’t have been screened before in another French event. There is no entry fee. You will find on our website the rules to be observed and the entry forms to be completed and to send us along with the DVD of the films submitted. JHWFF 2013 - Last Call for entries. See the 2013 SIZZLE REEL! JHWFF Sizzle Reel from JH Wildlife Film Festival. Don't miss out on Early-Bird Registration! Early Bird Discount Passes are available until the 15th of June... Visit: www.jhfestival.org/registrations/registration-festival.html Be sure to make that 20% saving!! The Wildlife Garden Project - How to help bats in your garden. The Wildlife Garden Project shows you how to help bats in your garden. Bats are in decline in the UK, but this video shows you a few simple things you can do to help these cute little critters. I've just picked up my latest job - a live interview as a wildlife presenter and expert on Sky News - through being listed on the Wildlife-film.com website. The Sky News producer was searching the web for a wildlife presenter who might be able to comment on a topical wildlife issue at short notice. When you google 'wildlife presenter', Wildlife-film.com comes really high in the ranking - which is how he found me. He then checked out my professional website (listed in my profile) and texted me on the number I'd included. We went from there - the next morning, I was being interviewed live on Sky News! So, what can I say - the site really works - thank you! It makes it really simple for industry professionals to find and contact you, particularly at short notice. Serena Cowdy is a wildlife presenter and journalist. You can contact her via her agent, Gerry Granshaw at David Foster Management. HIMALAYA - Mountains of Life by Kamal Bawa and Sandesh Kadur is launched! The Eastern Himalaya – land of Gods, of ancient mountain kingdoms, of icy peaks and alpine meadows – is like no other place on Earth. The life and landscapes of the region are as diverse, spectacular and fragile as the mountains themselves. Even today, these mountains hold many mysteries: unnamed species, primeval cultures and the promise of magical cures to heal all of humanity. Himalaya - Mountains of Life takes us on a journey of biocultural discovery, from the great canyon of Yarlung Tsangpo and the Siang Gorge in the east to the Kali Gandaki Gorge in the west. Along the way, Himalaya demonstrates through breathtaking imagery and words, why the preservation of this heritage is so important – not just for us, but for the future of all life on Earth. Live interview on May 15th 2013. Lucy Hockings interviews ATREE President and Founder Kamal Bawa along with filmmaker/photojournalist and founder of Felis Creations Sandesh Kadur about the impact of climate change in the Himalaya. DOEVILLE the movie: the fight to know and grow our food. The compelling story of one extraordinary woman's struggle to make her farm sustainable. Member, Kathryn Pasternak has been filming a documentary about farmer Gail Rose for the last three years. The film is called DOEVILLE. A pair of cranes nesting at WWT Slimbridge have produced what is probably the first crane egg to be laid in western Britain in over 400 years. The parents were released into the wild three years ago as part of The Great Crane Project reintroduction programme. Find out more in this video. Join the Red Squirrel Conservation Film Project! Encouraging people to see red. What's the world's favourite species? ARKive celebrated its' 10th birthday on the 20th of May (happy birthday from us!) and to mark the occasion, they asked for your help to find the World’s Favourite Species... 1 month, 162 countries, and 14,000 people later, a #FaveSpecies was chosen... It was the KAKAPO, with 9% of the total votes! The most frequently selected reason for voting this species as your favourite was “because it’s under threat and we need to protect it”. A video of illegal logging operations in the ecologically outstanding Raja Ampat Islands of West Papua has been released by environmentalists following the arrest of rogue Indonesian cop-turned-smuggler Labora Sitorus, who financed and coordinated timber theft on a huge scale. Filmed near the northern coast of Batanta Island in April 2009 by the London-based Environmental Investigation Agency (EIA), the footage documents loggers illegally felling trees without relevant Government approvals, before sawing them into planks and posts to await collection by boats at the beach. The loggers told EIA investigators their operation was illegal but that it exclusively supplied Labora Sitorus, who they knew to be a policeman. The loggers also admitted they had been running nine chainsaws across multiple sites around the western tip of Batanta for at least 18 months, indicating Sitorus’ involvement in illegal timber had been going on since at least 2007. With each chainsaw producing about 1.5m­3 of sawn timber a day, the gang featured in the film was likely supplying Sitorus’ business with at least 4,000m3 of timber a year. Loggers also trapped rare bird species for subsequent sale. Read the full report here. Rogue Indonesian Cop's Illegal Logging Operations (Video News Release) from EIA. China's top actress and United Nations Environment Programme (UNEP) Goodwill Ambassador, Li Bingbing, has joined the world's largest wildlife awareness campaign against the ivory and rhino horn trade in a series of public service announcements beginning with "War." This is the first of five live action spots featuring the screen star to air throughout China as part of the "Say No To Ivory and Rhino Horn" Campaign. Li joins fellow countryman and WildAid Ambassador Yao Ming, who launched the campaign in April 2013 in Beijing with WildAid, Save the Elephants, and the African Wildlife Foundation. Tickets for WildPhotos 2013 are now on sale! WildPhotos is back and this year will be better than ever! As well as the fantastic talks programme featuring the world's best wildlife and conservation photographers, including a keynote from the superb National Geographic photographer Michael 'Nick' Nichols, we also have some exciting new changes afoot. As part of the spectacular two-day event, we have an inspiring new range of workshops which allow you to get in-depth, technical and hands-on with some of the best in the industry. But that's not all. We've also introduced a new way of attending the event - you can still buy a one or two day ticket for the talks programme, or you can buy a ticket for one of our exciting new workshops, or mix it all up and have a half day of each with our Mix'n'Match ticket. The choice is absolutely yours. Interested?! Take a look at our new website and get your tickets before they vanish! Want to be more involved? We are now looking for volunteers for WildPhotos 2013 – click here to find out more! Sir David Attenborough presented the prizes and all the recipients were thrilled, especially Abbie! In the BBC Natural History Unit's 50-year history, there is only one big cat the unit has never filmed in the wild, until now - the Siberian tiger. Tiger expert Liz Bonnin and a team of scientists have filmed one of the world's most elusive big cats in the frozen wastes of Siberia for a new two-part series on BBC Two - Operation Snow Tiger. A special season of BBC programming and showcase events celebrating the UK's extraordinary wildlife. For the first time ever, the UK’s wildlife organisations have joined forces to undertake a health check of nature in the UK and its Overseas Territories. Launched by Sir David Attenborough and it made for grim reading with only a few glimmers of hope. 60% of British animal and plant species have declined in the past 50 years, and one in 10% could disappear if we don't act effectively now. Over 4000 fresh, new and exclusive high definition clips have been added to our natural history archive. From canopy feeding black herons (playing the "daytime night-time" game), to aardwolves, baby mole rats, and Africa's big five, this premier stock footage collection is now available at NHNZ Moving Images. Search our collection or send us your wish list and we will do your research for you. A beautiful collection of HIGH DEFINITION STOCK FOOTAGE for sale of nature, wildlife, cities, agriculture, time-lapse, Southern Africa tourism and much more, from Photos of Africa. The Drill Project - Conservation through film. Check out The Drill Project, a documentary that features the first-ever images of Bioko Island drills. The film is part of a conservation awareness campaign to reduce the illegal bushmeat trade on the island. See this interesting and well-made documentary about the critically endangered Hooded Grebe, produced in Argentina. Its goal is to create a National Park in the only area where the Hooded Grebe sets up its' nesting colonies. Made for Aves Argentinas, BirlLife International and Ambiente Sur Narrated by Maurice Rumboll, who first discovererd the species in 1974! The Environmental Film Festival Melbourne began in 2010 with a vision to inform and inspire people on environmental issues and has since grown into one of Melbourne’s most notable environmental social events. Showcasing a diverse range of the best environmental films from Australia and around the world and drawing large crowds from all over Victoria, EFFM has stitched its way into the diverse tapestry of Melbourne’s arts and cultural life. Wildeye Spring Book Offer: Buy Wildlife Film-making: Looking to the Future and get Wild Pages: The Wildlife Film-makers' Resource Guide at Half Price! Book 2) Wild Pages: The Wildlife Film-makers' Resource Guide – An essential piece of kit! All the best bits from a festival directory without the expense of actually going to one, and much more! Offer = Two books for £17.88 (Usually £23.90) and P&P is reduced as the books are being sent together. Panasonic's "Dehazing Technolgy" feature for Industrial Medical Vision new product range GP-MH322, GP-MH326 and GP-MH330 ensures that foggy or hazy images are reproduced clearly and sharply.. The following night-vision clips were taken with a Raptor Hawk HK247-AP Black and White EM-CCD (Electron Multiplied-CCD) camera fitted with a Pentax 12mm F1.4 lens. They feature a series of clips of deer feeding at night plus a brief clip of a passing car to illustrate just how dark conditions actually were. Filming was taken over a 1.5 hour period from dusk at 20.00 hours on 10th April 2013. There was zero light pollution and a new moon (it was a moonless night) so the EM-CCD camera technology was really pushed to get these clips. Images were taken from an observation hut in a forest North East of the village of Mlyncecky close to the High Tatra mountains in SLOVAKIA. Our sincere thanks go to Pan Miso Soltys (Jelen-meister!) for this opportunity. Click to see the full profile or add your name to this list! Disclaimer: Wildlife Film News publishes information and opinions as a service to its readers. Opinions expressed in Wildlife Film News are not necessarily those of the producer.